The Mössbauer Effect Data Center is a research center of the Dalian Institute of Chemical Physics within Chinese Academy of Sciences, operating from the Dalian Institute of Chemical Physics. The current number of data records in the MEDC database  over 100,000. We'll be performing maintenance on MEDC server on 22 June, 2018 from 09:00 to 10:00(GMT+8). The server will down during maintenance. 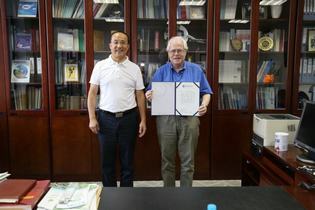 Effective 1 July 2010, the Mössbauer Effect Data Center has been located at the Dalian Institute of Chemical Physics, Chinese Academy of Science. Future correspondences should be directed to either the new Director, Prof. Tao Zhang (taozhang@dicp.ac.cn) and/or the Secretary General, Prof. Junhu Wang (wangjh@dicp.ac.cn). Find out more about becoming a Sponsor or Affiliate.